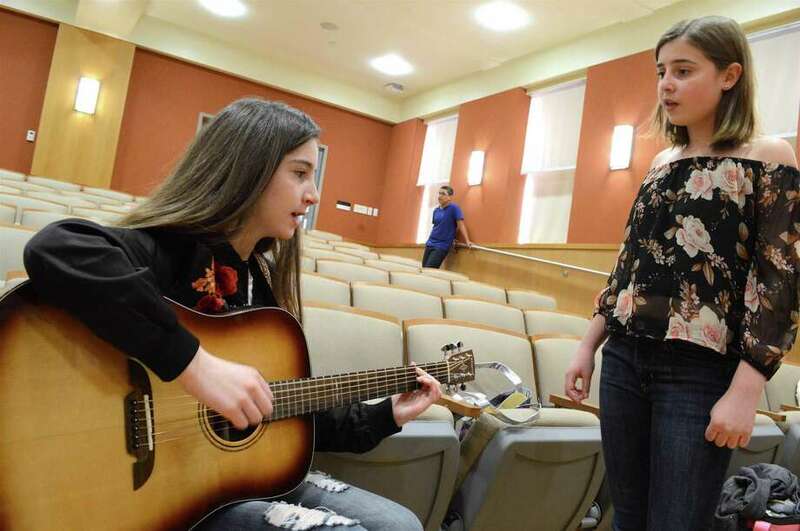 Anya Napoli, 12, left, and Rica Monaghan, 13, of Darien, practice "Work Song" at the Teen Talent Show held at Darien Library, Saturday, April 21, 2018, in Darien, Conn.
DARIEN — Everybody’s got talent, but on Saturday night a group of local teens demonstrated a ton of it. Darien Library hosted its annual Teen Talent Show this weekend, organized by the library’s Teen Advisory Board. “And we have so many talented people in this town,” she said. There were several prizes for the kids who competed in song, dance and comedy, including $200 for the winner. Judges included Jane Minnis, orchestra director at Darien High School, Tim Sorensen, its theater director, and Bryan Wallman, its resource police officer.